I don’t profess to be an expert on belly dancing. I can’t even confess to understanding the journey to master the gift of dance since it was not significant in my childhood. I can testify learning belly dance awakened culture conditioning including forbidden zones and expectations from me as a woman in a Western society. It conjured old ghosts and required me to let go of a lifetime of disappointment. As I learned the new lingo and standards, my personality shaped and molded the dancer I was becoming. Sinuous movement, pageantry of costumes and bond of the dancers muted the concern of body image. 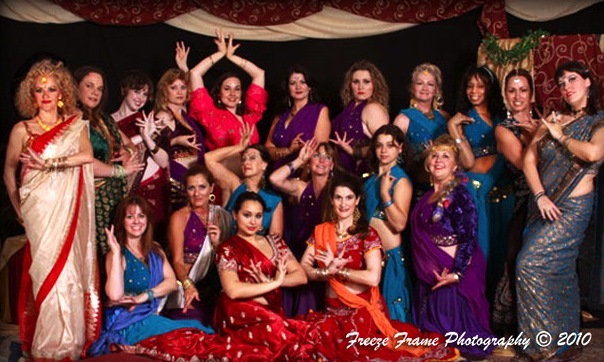 The Palmetto Oasis Middle Eastern Dance Troupe – I’m in the center! The art of belly dancing is perceived as an art or in the eyes of some, a sexual dance. I’ve watched the sensuality of the dance mislabeled stripping. The intensity of the movements reach deep into a woman’s soul and retell her story. The body becomes an instrument of expression. There is a loss of rigidity and a new place of vulnerability. An attitude and joy that is drawn from deep within the exploration of one’s identity and journey comes from belly dancing summoning the heart. It opened my eyes to learn the story of other women, rituals and cultures. My instructor pushed me to find courage to look at the road behind and believe it is why I am where I am. For the past five years, I attended dance conferences with members of my dance circle. I’ve met Ansuya, Tamalyn and Amani. I explored tribal and tribal fusion in Ft. Lauderdale at Spirit of the Tribes. On a weekday, we caravanned to Newberry to attend Bellydance Superstars and return on the same night. In California, I sat at the feet of Jamila and Suhaila Salimpour seeking jewels to add to my dance chest. Jamila shared a lifetime of dance which she passed onto her daughter at a very young age. I admired the pride of a Persian ancestry and felt embraced into the Salimpour circle even in my inexperienced state. So, like the little girl in the above quote, I sensed their smiles as I stepped onto the studio floor wanting to hone my new found love. This entry was posted in Bellydance, Musings and Amusements by KVarn. Bookmark the permalink.